TD Bank has launched a street level experiential campaign in New York to promote its tree-saving initiatives and reduced paper usage. The campaign, created by Tierney, excludes printed media and collateral and its street team will offer only spoken information. 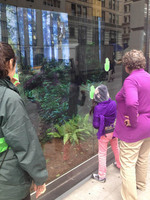 Beginning this week at TD Bank's 5th Ave. & 14th St. location, a 12' x 9' touch-screen interactive video wall will let downtown passers-by get the attention of a deer, squirrel, rabbit, bear or owl while an LED ticker scrolls out habitat acreage preserve, in terms of NYC landmarks ("13 New York City blocks of forest" monthly, or each year, "a forest area larger than Central Park"). Across Manhattan, during October through November 11, two roving audio-enabled electronic view masters akin to those the drop-a-quarter-in-the-slot binocular viewers found at vistas from Niagara Falls to the Golden Gate will give New Yorkers' a view into this vista as well. The viewers, accompanied by TD Bank street teams, will be at Columbus Circle, Rockefeller Center, Herald Square, Madison Square, Union Square and outside the 14th St. Apple Store, among other locations between 7:30 AM - 9 PM. Additional support for the ambient campaign includes 50 2-sided video screens atop subway entrances and a 16-million impression digital banner buy on sites including AOL, 24/7 Real Media, NYTimes.com and NYDailyNews.com, plus paid placements on Facebook and Twitter.